Nuclear accidents – like oil spills and financial meltdowns – happen because big companies push to make more money by cutting every safety measure in the books. The accident at Fukushima was predictable. After initially contesting the findings, the plant’s operators, Omaha Public Power District, said that the problems had been resolved. A nuclear plant was inches away from being engulfed by the bloated Missouri River after several levees in the area failed to hold back its surging waters, raising fears it could become America’s Fukushima. The river has to hit 902 feet above sea level at Brownville before officials will shut down the Cooper Nuclear Plant, which sits at 903 feet. It stopped and ebbed slightly yesterday, a reprieve caused by levee breaches in northwest Missouri – for now. The river is expected to rise as much as five to seven feet above the official ‘flood stage’ in much of Nebraska and Iowa and as much as 10 feet over in parts of Missouri. The corps predicts the river will remain that high until at least August. The river has risen at least 1.5 feet higher than Fort Calhoun’s 1,004-foot elevation above sea level. The plant can handle water up to 1,014 feet, according to OPPD. The water is being held back by a series of protective barriers, including an 8-foot rubber wall outside the reactor building. Likewise, the Cooper nuclear reactor – also in Nebraska – is threatened by the flooding as well. Notification is being made to the Nebraska Department of Environmental Quality regarding the release of oil to the Missouri River from the Cooper Live Fire Training Facility. Currently, levees separating the Training Facility and the Missouri River are being over topped due to flooding of the Missouri River. This condition has resulted in flooding of the burn pits in the fire training facility, with the subsequent release of the residue which includes unburned fuel oil. Any release of this water containing oil to the Missouri River is uncontrolled at this time. Then is no radiological contamination in this area. The highest reading at Cooper on Sunday was 900.6 feet above sea level, [Nebraska Public Power District] spokesman Mark Becker] said. A levee on the other side of the border into Missouri is dangerously close to breaking. Atchison County authorities say it’s only a matter of time before a flood of water washes through areas surrounding Highway 136. Emergency management officials say the area is turning out to be a total loss causing sandbagging to stop. Instead, relief efforts are now more focused on locations to the south of Brownville. [NPPD] insists the 37-year-old Cooper Nuclear Station in Brownville, which sits on the raging Missouri River, is as secure as they come. [T]he federal government’s own Sandia National Laboratories has concluded that similarities between the Dai-Ichi plant and reactors like Cooper pose a significant problem: specifically that a lengthy loss of electrical power could cause a nuclear meltdown. Hopefully, both Nebraska reactors will ride out the storm without any major problems. But as I have documented in detail, our nuclear policy has never paid any attention to safety, and has been a disaster waiting to happen from day one. If one of the Nebraska reactors (or another American plant) leaks, it will be entirely predictable … like Fukushima. What are the risks of an earthquake beneath a reactor near you? 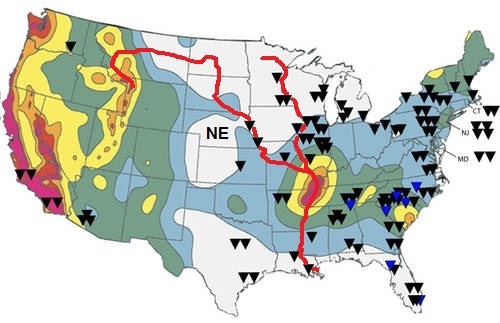 This image combines a 2006 map by the United States Geological Survey showing varying seismic hazards across the U.S. with locations of nuclear reactors. Reactors in black are active; reactors in blue are proposed sites for the new model known as the AP1000. Probability of strong shaking increases from very low (white), to moderate (blue, green, and yellow), to high (orange, pink, and red). Kimberly Leonard/Center for Public Integrity. Earthquakes can occur in all sorts of locales. In January 1986, a late-morning quake measuring 4.96 on the Richter scale was blamed for cracks in the Perry Nuclear Power Plant on Lake Erie near Cleveland. At first, people thought it wasn’t a quake; speculation focused on an explosion somehow related to the Challenger space shuttle disaster or an attack on New York City. The newly licensed plant’s reactor was to be fueled for the first time the next day. Officials and the public were caught by surprise; few suspected Northeastern Ohio was in an active seismic zone. But it is. Experts determined that the quake’s epicenter was 11 miles from the plant, which has been dogged by controversy ever since. Joe Litehiser, a Bechtel Corp. researcher, has studied the implications of earthquakes on licensing of proposed new nuclear plants in the central and eastern U.S. Litehiser said there is more seismological information available now than there was decades ago, when the existing plants were built. Scientists now believe, for example, that major earthquakes occur around Charleston, S.C., every 550 years instead of several thousand years apart, as industry models had assumed. This is relevant not only because South Carolina has seven active reactors, but because four more units are planned for the state. Applications filed by the proposed operators, Duke Energy and South Carolina Electric & Gas, seek NRC permission to build Westinghouse Advanced Passive 1000 (AP1000) reactors in Fairfield and Cherokee counties. In a March 7 letter to NRC Chairman Gregory Jaczko, U.S. Rep. Edward Markey, D-Mass., wrote that one of the agency’s own experts believes the AP1000’s shield building could “shatter like a glass cup” in the event of an earthquake or a similar disaster. The NRC’s assumptions regarding a worst-case accident are ridiculous. For example, the NRC assumes only 1% of the fuel could meltdown, while 70% melted down at Fukushima. The NRC assumes no loss of containment, while there has been a major loss of containment in reactors 1-3 (especially 2) at Fukushima. We have 4 reactors in California – 2 at San Onofre 2 at San Luis Obisbo – which are vulnerable to earthquakes and tsunamis. And remember that a major nuclear accident – such as one at Indian Point – could bankrupt a nation.